current page Vive La France! The MS Trust has a fantastic opportunity to raise funds next year as we have been named the official charity partner for the special Tour de France edition London to Paris cycle ride! 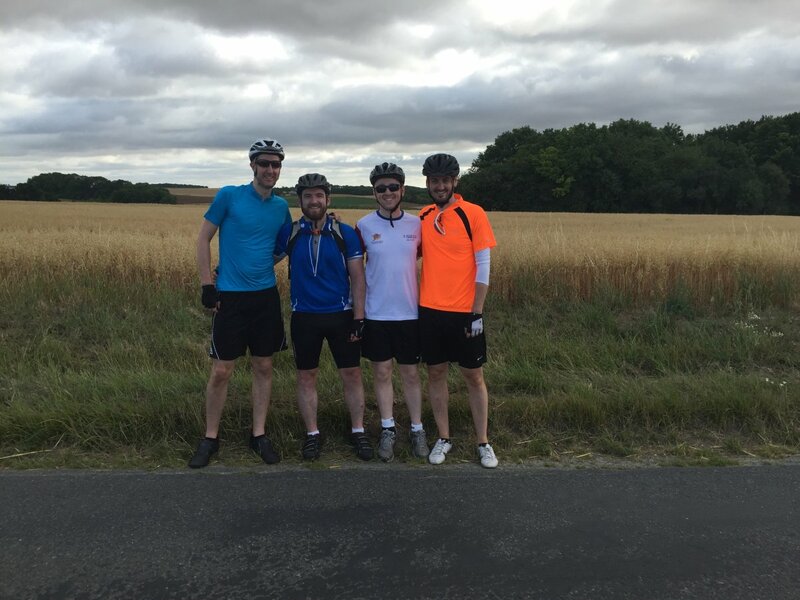 We are looking for 50 cyclists to join our team and raise sponsorship to help us support people with MS. Joe Hill, who took part in the ride this year with three of his friends, tells us why he decided to take on the 300 mile journey. Everyone tells you that MS affects each person differently - both those diagnosed with the condition and their closest friends and family. While everyone tells you this, they don’t tell you how to deal with it. My way of dealing with my wife being diagnosed was getting my three closest friends to agree to cycle to Paris with me and signing us up for the ride. Selfishly, I wanted to do something that made me feel like I was contributing. I wanted to feel like I was helping with what my wife was going through. Physically I felt I could only do so much to help her through a relapse and mentally I felt I could do even less. Only two of us had bikes in January and with the ride in July we all thought it would be tough. I found the training a big commitment but relatively easy, most of it was time spent riding with and talking to friends (not doing it on your own makes it easier) and the hours were worth it in the end. The fundraising was daunting but we were lucky with everyone’s generosity raising around £10,000 which was so far past any target we set. Most of this was through sponsorship but friends helped us organise a BBQ and raffle which raised over £1,000. The ride itself was incredible. It was so well organised by the fantastic team at Skyline with loads of support from the crew and other riders. There were a couple of tough days at the start filled with hills and 39 degree heat, but you get to enjoy great views and a great route throughout. Afterwards the sense of achievement and knowing we had raised so much money for the MS Trust meant that all the hard work had paid off. I’d really recommend signing up as this is a great ride raising money for a great charity! Could you help us grow our London to Paris team? As the official charity partner, we really want to make the most of this opportunity to raise awareness and funds and get as many people involved in the July ride as we can. We already have a great team of people signed up, but there are lots of places still available. If you can help us spread the word by telling your friends and family, displaying posters somewhere or sharing the event on social media, we would be very grateful. If you’re considering taking part yourself, there’s plenty of time for training, even if you’re not an experienced cyclist. We will provide a training guide that advises on the type of bike to use, what clothing to wear and what to eat and drink, as well as a detailed 16-week training programme. We will also provide fundraising ideas and materials to help you reach the £1,460 sponsorship target. We may be able to accommodate riders who wish to take part using adapted cycles – please get in touch if you’d like to discuss this option. Cycling from London to Paris is one of the greatest European cycle experiences. There will be long days in the saddle and some strenuous hill-climbs, but the picturesque countryside, camaraderie with your fellow riders and the sense of achievement when you reach the Eiffel Tower will make this a really memorable adventure. As an extra special bonus, the final day of this London to Paris cycle ride coincides with the 2016 Tour de France finale. So the day after you have finished your own cycle challenge, you will have the chance to watch the Tour de France riders race to the finish line on the Champs-Élysées. To find out more about the London to Paris Tour de France cycle ride, call Laura on 01462 476707 or visit mstrust.org.uk/londontoparis.